Vertex 3 Released With Jquery! Vertex 3.0 is now available for download! This new version of Vertex brings compatibility for Joomla 3.0, but more importantly the entire framework has been converted from Mootools to Jquery! Please take the time to read this entire post, and we hope that you find it informative and beneficial. Before we go any further we want to stress that Joomla 3.0 is strictly for developers and advanced users. If you are currently using 2.5, stay right where you are and do not upgrade until at least Joomla 3.5! Unless you are a very experienced user or developer we also recommend still creating even new websites with 2.5 because it is a more stable platform with many more extensions available for it. These are recommendations from Joomla themselves and we agree with them. The Vertex 3 patch can be applied to any template that is listed as Joomla 3.0 compatible on our compatibilty list. If a template is not yet listed as Joomla 3.0 compatible do not apply this patch. Please check the compatibility list frequently as we will be listing more Joomla 3.0 in the weeks to come. Please note that this patch is for new websites only! If you are currently running a Vertex 2 template on Joomla 2.5 we do not recommend upgrading to Joomla 3.0. We will provide a tutorial for upgrading existing sites to Vertex 3 at a later date. Bootstrap - As explained in our previous blog post consists of both typography elements and a responsive layout. In Vertex 3 we have customized the Bootstrap typography elements to fit nicely within the Vertex style of each Vertex template. While many template developers will only be including Bootstrap into future templates, Vertex 3 will call Bootstrap css files for all Vertex templates, even ones already created! We believe this is absolutely crucial as many of the core Joomla layouts now use the Bootstrap layout and classes, such as the search, contact, login, register and many other pages. Without including Bootstrap these core pages simply would not be stylized. Because Vertex 3 includes Bootstrap this ensures that these pages will be stylized correctly. Additionally, this also means that any third party extensions that are taking advantage of the Bootstrap framework will also be stylized as well and will work with no issues at all! Because Jquery is now included in the core of Joomla, and Mootools is now labeled by Joomla as a "legacy" script, it is our general assumption that Mootools will soon be deprecated from Joomla altogether. This is where we would like to take a moment to brag about what we've done with this conversion! This conversion was not just about making our products compatible with Joomla 3.0, it was about making them compatible for years to come and versions to come! Many other frameworks and extensions by other developers are still being produced around Mootools, and if Mootools is soon deprecated all of those products will need to be updated, which means more updates for the webmaster of those sites to perform. Instead of simply converting the php of our products to make them compatible with Joomla 3.0 we wanted to take the extra time now to remove it and focus strictly on Jquery within our products, and that is exactly what we have done! The entire Vertex 3 framework is now controlled entirely by Jquery and no Mootools calls at all! We didn't stop there though, if we're going to convert our framework then we should also convert our modules to Jquery too, right? We have recently released several of our most popular extensions to be compatible with Jquery as well! We currently have seven modules that were once run by Mootools that are now converted to work with Jquery! The best part is, they work with Joomla 2.5 and 3.0! In Joomla 2.5 the modules will work with Mootools, and in Joomla 3.0+ the modules will automatically convert over to Jquery all on their own! This means you can build your 2.5 site now and upgrade to 3.0 or 3.5 with no problems at all! Site shapers listed on our compatibility page that are labeled as being compatible with Joomla 3.0 already include these updated modules. We hope you enjoy all the hard work that's been put into Vertex 3, and we look forward to the future developments of Joomla 3.0 and beyond! With the release of Joomla 3.0 we wanted to update everyone on the changes within Joomla, modifications to Shape5 products, and our recommendations for moving forward. Will My 2.5 Product Work With 3.0? Will There Be Multiple Versions of Products Again? Shape5 has been around since Joomla 1.0 and we know the confusion and frustration that multiple versions of products often cause. Unfortunately, due to the many changes in the core Joomla functions many of the products will need to be updated again to work with 3.0, just as they were from 1.0 to 1.5 and 1.5 to 1.6. Vertex templates will simply be updated with the Vertex patch mentioned above, and possibly some css additions. Our goal as we update each product is to create a single file that works with both 2.5 and 3.0+ using JVersion. This will ensure that multiple versions are not needed, this will definitely be true of Vertex templates. Creating a Vertex patch is our first priority, and we will then beging converting older templates and extensions. Because our goal is to release only one version of each template that means we will also be releasing only one site shaper. We will package our shapers with Joomla 2.5 for quite some time. Those who are interested in upgrading to 3.0 can do so in the backend of Joomla after installation. How Will Shape5 Incorporate Bootstrap? This is really a two part answer. The first part of Bootstrap is a vast array of typography items, buttons, tabs, menus, etc. The other part of Bootstrap is the layout itself and it's responsive media queries. We will address each of these below individually. 1. Custom Row Sizes - This is one of the top features that we offer in Vertex. In any given row of modules in a Vertex template you can specify the exact width of every module in that row. This is all done very easily in the Vertex admin. In boostrap you are simply stuck with the pre-determined widths that are set by the class name of that particular module, ie: the 12 sections/columns in each row that are described above. For example if you wanted a module row to have three modules at 37%, 22%, and 41% you could do that very easily in Vertex. In Bootstrap you can't get widths that specific, it simply goes by how many sections/columns you want that particular div to stretch. 2. Fixed or Fluid - Our layout has the option for a fixed or fluid layout, both which will work with responsive. In addition to this there is a maxium body width, which does not allow your site to get any larger than the width that you determine. The maximum body width feature is useful to prevent your site from becoming too large on very large screens. 3. Optional Responsive Layout - In Vertex you have the option to disable the responsive layout and use a standard layout instead. We must admit that this feature will probably grow less popular as time goes on, but it does allow developers the flexibility to design the site how they want, and not be forced into a particular layout. 4. Column Width Changes - In boostrap the left and right columns are percentage based, this can cause the columns to be extremely wide on large monitors and out of proportion, and very narrow on smaller screens. In a Vertex template they are set to a pixel width that you determine so you always know what size the columns will appear at. If you wish you can enable a feature that will increase the columns on larger screens and reduce them on smaller screens as well. This feature gives the columns a much more consistent look on every screen. 5. Row Module Width Redistribution - If you are using a lot of modules in one particular row this can cause your content to look squished when viewing your site on a narrow screen. The row module redistribution feature allows you to split a single row of modules into several rows to give each module more room. You get to control how how many modules show on each row, and the exact screen pixel width that the new layout will trigger at. Each row can be individually configured. Bootstrap does not have this feature and other template providers have compensated for this by hard coding specific widths into the css files rather than allowing you to choose. 6. Desktop Link - Even though Vertex uses a fully responsive layout and there is no separate layout page for mobile devices, that does not mean that your site's viewers will understand this or even know what a responsive layout is. It has become a standard for websites that use a mobile layout to have a link to view the desktop view of the website, and this is what your site viewers will expect to see. This link simply turns off the responsive configuration using a cookie and calls the website like a standard desktop would when viewing in mobile. There is then a link to return back to the mobile view of the site. 7. Hide Classes - Vertex includes several dozen hide and show classes that allow you to hide or show content or modules at specific screen widths. This is used for content or extensions that do not work well at specific screen widths. Bootstrap does contain this feature but by default there are only three hide classes and three show classes available to work with. In addition to hide classes you can also hide entire sections of the template directly through the Vertex admin configuration's user interface by selecting areas from a list. 8. Mobile Size - One thing that we do not like about the Bootstrap layout is how early the mobile layout triggers. The mobile/single column, layout is triggered at 767px in Bootstrap. This essentially means that all 7 inch tablets and below will be forced to view the single column layout. It is our opinion that this is too early. The Vertex layout does not trigger a single column layout until 580px, which is the width of most larger cell phones. You can always use the Row Module Width Redistribution if you wish to change a particular row to single column or two columns if need be for smaller screens. As stated above we will be including the Bootstrap js and css file calls for extensions, and future elements of our templates, but as for the layout itself we will be sticking with our Vertex responsive layout because of the benefits mentioned above. Going with this approach will not cause any issues with default Joomla or third party extensions. The features mentioned above will give Vertex templates many more features than a standard Bootstrap template, and ultimately much more flexibility for users and developers. Each row in a Vertex template contains six module positions. If you are using a lot of modules in a particular row the content can become squished when the screen becomes too narrow, specifically on smaller seven inch tablet screens. This new feature will allow you to change the layout into multiple rows with new module widths to give each position more room at specific screen sizes. Be sure to choose the option that makes sense for the amount of modules you have in each particular row. Single Column will set all modules in that row to 100% and one module per row. Two Columns will set all modules in that row to 50% and two modules per row. Three Columns will set all modules in that row to 33.3% and three modules per row. Redis. 33/50 will set positions 1 through 3 to 33.3% and positions 4 through 6 to 50%, this setting is meant to be used when positions 1 through 5 are in use. Redis. 50/100 will set positions 1 through 2 to 50% and positions 3 through 6 to 100%. This setting will override any custom row widths you set under the Row Sizes tab when the screen size reaches the selected width. All modules will always change to a single column at 580px for mobile view. This feature is NOT available for IE7 or IE8! 25% Off "Give Back Sale" Now Until 9/8/2012! Receive 25% OFF all memberships from now until 9/8/2012! Don't let this sale pass you by: this is one of our largest discounts ever, and sales like this don't come around very often! Be sure to read the details of this sale below. What do website templates and needy orphans have in common? Simple, you! This week we are very excited to launch the "Give Back Sale"! Proceeds of this sale will be sent to 58ten, a non-profit organization. 58ten provides aid to an orphanage in Kenya, Africa to approximately 150 children, and hopefully more someday soon! It's our way of giving back and making an impact in the lives of those much less fortunate than most of us. The purpose of this sale is to bring awareness to the needs of 58ten, and to raise as much money as possible for the children of this orphanage. The money raised during this sale will go towards specific needs such as construction materials, food, bedding, medical care, education, clothing, and more! The funds will be used at the discretion of the 58ten management team. Why did Shape5 pick 58ten? One of the founders of 58ten is a close friend of the owners of Shape5, Mike and Jonah. Because of this close friendship the needs of this organization are close or our own hearts, and we would like to do our part to make this need known to all. We are confident that the money raised during this sale will be used in the most beneficial ways possible by 58ten. Can I donate to this organization without purchasing a membership? It's June 15th and as promised we have launched not one, but two responsive layout templates! 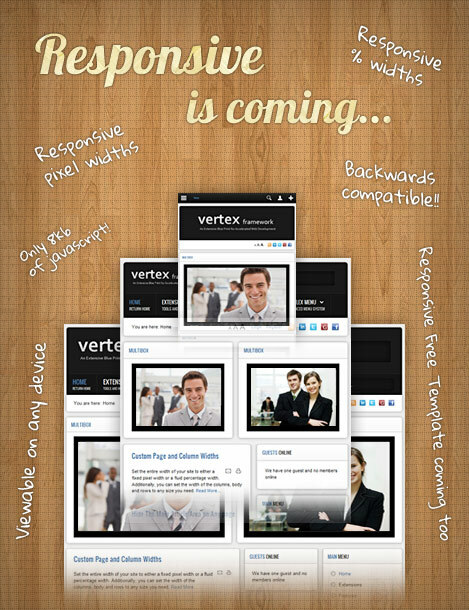 Corporate Response and the Free Vertex Version 2 template, are both built with optional responsive layouts. That's right, you get a totally free responsive layout template this month in addition to our out of this world club template, Corporate Response! Our Vertex 2 template framework has made responsive layouts a permanent feature here at Shape5 for all future templates! We believe we have come up with the best possible responsive layout, with the most flexibility and ease of use possible! Be sure to check out the demo of each template to see it all in action! We have released a lot of very useful information this month as well to go along with our new Vertex 2 template framework. Below we'll document everything for you in one consolidated area. This tutorial will give instructions for converting a our free Vertex template from Vertex 1 to Vertex 2 with all responsive features. Please note, that if you have heavily modified your template's layout or css we do not recommend performing this upgrade. However, if you have made very minimal edits the edit should be fairly straightforward and easy to do. This will not over-write commonly edited files like template.css or index.php. You may also simply update to Version 2 by using the upgrade patch, but this will not enable any responsive features, only the instructions below will enable responsive features. We do not recommend making this change on a live site. Be sure to test offline or in a development area. Please also note that this will disable your current mobile layout, and enable the responsive mobile layout instead. 2. You will need to make the following changes in the template's index.php file. Note - s5_responsive.css contains new css to stylize the template at varying screen sizes. If you need to make any modifications this is the best place to add your changes. 4. Edit the template.css file and find the #s5_logo section around line 355. 6. Enter the template configuration via the Template Manager in the backend of Joomla and make any modifications to the configuration that you wish, and you're done! We wanted to take this time to update everyone on some very exciting news coming to Shape5 this June. First, we will be releasing Vertex 1 for our Wordpress Themes Club, and all future Wordpress themes will be released on this new platform! This will bring many of our newer design techniques, and features such as the S5 Flex Menu, custom row sizes, and a lot more to our Wordpress themes. Second, we will be releasing version 2 of our Joomla Vertex framework, which includes the very anticipated responsive design layout along with many other great features! More information will follow in the coming weeks about this new version but for now we wanted to explain our approach to responsive design. This is the approach that we will be taking at Shape5 for all on-going Shape5 Vertex templates. We believe this is the best approach and will be the most user-friendly for our members. Some template providers have begun releasing special editions of their framework that allow for responsive layouts on a particular template, and that is the only layout that can be used on those templates with very minor adjustments to the layout. We wanted something concrete and permanent; something that can be expected from template to template as part of our official framework, not a special version of our framework. Our approach allows our customers to use the already existing Vertex layout and simply enable or disable responsive media queries if they wish. That's right, it's completely optional! If you're not familiar with responsive layouts then you do not need to use it, simply use the default fixed or fluid layout instead. The responsive option will work with both set pixel widths and fluid designs. Fluid designs are already a part of all Vertex templates for support of very wide monitors. We've added the ability to stretch images and increased column widths for extra wide monitors on the responsive layouts, everything else already exists in the Vertex layout. There are a lot of factors to consider when using responsive designs: Will my extensions works with responsive layouts? (most do not) Am I comfortable enough with responsive layouts to use this functionality (That is why it is completely optional in our framework). When designing templates and frameworks we have to keep in mind that we are developing for advanced programmers and people brand new to setting up websites. Our approach to responsive designs was to allow for the flexibility to meet everyone at their own skill levels, and not create something too advanced for the average user and to not leave developers looking for me. Our approach to responsive design gives you all the options you could ever need when setting up a template! 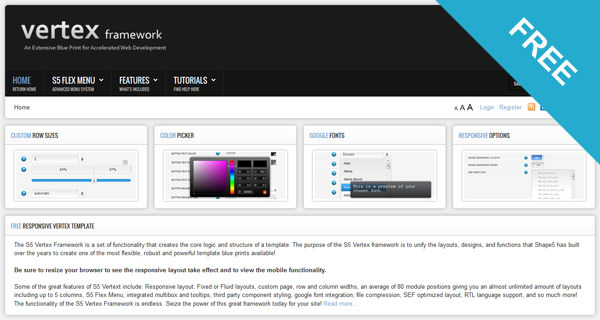 Vertex and it's responsive options is by far the most flexible framework available to date! Just a quick note about third party extensions. Most third party extensions will not work with responsive layouts, but we are confident that many developers will adjust their products for these types of layouts in the near future, as are we. Because not everything is compatible with responsive layouts, you have the option to turn the responsive layout options off, or you can hide certain areas of the template when it reaches tablet size or mobile size. This option makes it possible to hide modules that were not built for responsive/fluid layouts so that your overall page layout is not effected. The best part about our approach is it is completely backwards compatible! All the great features of Vertex that you are familiar with and love such as custom column widths, fixed or fluid body width, custom row sizes, etc. will all still be available to you even when responsive layouts are enabled! The rows and columns will not be set widths, you will still have control over your layout and know exactly where your content will appear on any given device. Ok now for the best news of all! Our June Joomla club template will be our first official template built on Vertex 2 using it's responsive features! But wait, there's more, we will also be re-releasing our very popular free Vertex template upgraded to Vertex 2 with responsive layouts already enabled! That's right, a Vertex 2 powered responsive design all for FREE! In addition to that we will be publishing an upgrade tutorial for anyone currently using the free Vertex template that will allow them to take advantage of the new responsive features as well with very minimal changes needed! The upgrades to this template are close to being completed, and will most likely be released around the same time as our club template. More information about Vertex 2 and the free Vertex template will come over the next few weeks. Stay tuned! We are honored to have our May template release of Salon n Spa ranked as #1 template for by CMSGadget! CMSGadget has started to rank the Joomla templates and Wordpress themes released each month by releasing videos each month with their results. Check out their site for more details. Please Welcome Paul Middleton To Shape5! Please give a warm welcome to the newest member of the Shape5 team, Paul Middleton! Paul has been interning with us for a few months and we have officially hired him to take on his primary role of Joomla forum board moderation. Paul is a very educated web programmer and all around pleasant guy to work with! We think he will be a great addition to our team and a great to service to the entire Shape5 community in the forums! Paul began hard coding websites in the early 90's before any type of real CMS had taken form. Around the year 2002 he began transitioning into a CMS web design approach and finally settled with Joomla in 2009 and some Wordpress. He has never turned back! He has built several websites for large companies and ecommerece platforms for photographers. Paul has a very good knowledge of css styling and is great at debugging problems. Aside from web design Paul is also a photographer, and he has a very good eye for design! His knowledge of websites, his skills in css, and his great overall willingness to help is why we have brought him on board and we think the whole Shape5 community will benefit from him greatly! Again, please give him a warm welcome, either here on this post via the comments, on Facebook, or if you bump into him on the forum boards, and make him feel welcome as he settles into his new home at Shape5! Also, a quick update on the conversion of our Virtuemart extensions to Virtuemart 2.0 and Joomla 2.5. Our 5 Virtuemart extensions have reached their final phase of testing and we hope to release the final products in the next week or two for download. These conversions are much more in depth than a standard Joomla 1.5 to 2.5 conversion as much of the Virtuemart core structure was changed in the new version. Thank you for your patience while we complete these conversions. Once these extensions are finalized that completes the conversion of all of our extensions to 2.5!